“Vesper Time: The Spiritual Practice of Growing Older” by Frank J. Cunningham. Orbis Books (Maryknoll, New York, 2017). 138 pp., $18. “Aging Starts in Your Mind: You’re only as old as you feel” by Notker Wolf with Leo G. Linder. Paraclete Press (Brewster, Massachusetts, 2017). 205 pp., $17.99. “Ageless Soul: The Lifelong Journey Toward Meaning and Joy” by Thomas Moore. St. Martin’s Press (New York, 2017). 286 pp., $26.99. These three books are like the parable of the blind men and the elephant — each person touched a different part of the animal and so ended up describing it in ways the others found incomprehensible. Aging, of course, has as many facets as that elephant, so it is not surprising that authors with varied experiences would write about this time of life with different emphases. Of the books under consideration, Frank Cunningham’s wonderful “Vesper Time” is perhaps the most accessible. Cunningham, the retired publisher of Ave Maria Press, has an engaging prose style; it is easy to tell he has spent a lifetime crafting words into sentences. Rather than suggesting ways that spirituality can assist an older person in the transitions required of aging, he proposes aging itself is a spiritual practice. Although Cunningham claims he is “piously impaired,” it is impossible to read this book without seeing how deeply his lifelong Catholicism has formed him into the man he is. “My desire to be a spiritual person is largely a triumph of hope over experience. So I look for God’s presence in creation and relationships.” Despite this modesty he clearly sees God’s presence in his life; a reader of this lovely book will be inspired to take up the same task. Benedictine Abbot Notker Wolf was, until 2016, the abbot primate of the Benedictine order and among the gifts of his “Aging Starts in Your Mind” is its portrait of monastic life. As an older monastic, Abbot Wolf has meaningful work, a strong vocational identity, affection and respect from, and companionship with, religious confreres of all ages and a busy life that includes wide travel. In contrast, many older people wrestle with loneliness, economic and social poverty, and the hardships of affording medical care. Some might envy Abbot Wolf’s exemplary aging. He writes in an easy, conversational way that gives this book a warm, pastoral tone. He doesn’t set impossible standards for himself, or for the reader (moderation is one of the hallmarks of Benedictine spirituality.) He is encouraging and straightforward, offering advice on everything from diet (“I swear … by the Italian formula: if it tastes good, it’s healthy, and ‘joie de vivre’ is the best life insurance”) to dying. “At the end of life, everyone is confronted with a new task. Throughout our lives, we are eager to remain, and now we suddenly must agree to our departure. …To get to this state, we have to redirect our will to live in another direction.” This is a lovely book by a happy and healthy monk, a good man to meet. 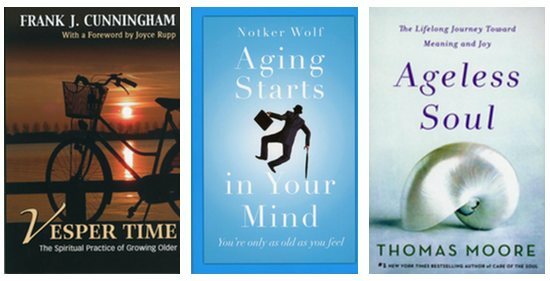 Psychotherapist, teacher and writer Thomas Moore (best known for his 1992 book “Care of the Soul”) brings his attention to aging in “Ageless Soul.” His expansive treatment of aging draws on his personal experience, illustrations from his therapy practice and insights from Jungian psychology. Where Cunningham and Wolf inhabit their books, Moore seems strangely distant, revealing only a pedantic personality of considerable accomplishment who invites the reader to applaud his astuteness. It fails to impress.